Exciting news - Ravenwood Castle was visited by Princess Katy. For more information, go to "Princess Katy Visit"
Ravenwood Castle is located 7 miles north of McArthur Ohio just off of Route 93. Fifty acres of forest and large rock formations surround the castle which is reached by a half-mile private road. It is styled after twelfth-century Norman castles. The Great Hall has a stone fireplace at one end and at the other end are three large stained glass windows from an old church. A "drawbridge" leads to the front door. 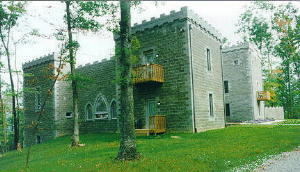 The castle was built in 1994 by Jim and Sue Maxwell and is now operated as a bed & breakfast. Visit the Ravenwood Castle website by clicking here. Patty and I visited this castle in March of 1999, and spent the night there. The castle was for the most part designed and beautifully decorated by Sue Maxwell, the owner. There are no televisions in the rooms although there is one in the library downstairs. If you are looking for a loud vacation, don't go there, but if you're looking for peace and quiet, you can find it at Ravenwood. You will enjoy meeting Sue Maxwell. She is a person who has found her niche in life, she is very good at what she does, and better yet, she seems to enjoy doing it.